I'm new here and I'm a german so i may write bad english. So I downloaded the newest version of Dolphin because I want to play Metroid Prime again for the good old times. What I'm asking about is what are the best settings in Dolphin 4.0.2 to play Metroid Prime bearable? My problem is that i have a bit lagy gameplay and stuttering audio which destroys the atmosphere of the game. So I hope you guys can help me out. I already red that Metroid Prime is one of the Games you can't play on full speed. I just need some help to make it bearable. There are known issues with Micro-Stutter, savestates, your visor in-game, and more, however, it doesn't seem to require any non-default settings to run properly. Just take a gander over on that page and see if this help you solve any of your lag issues. It would be version 4.0-5762. Thank you very much, sir. I will look on that page and install the development version. If anything helped i will reply again. 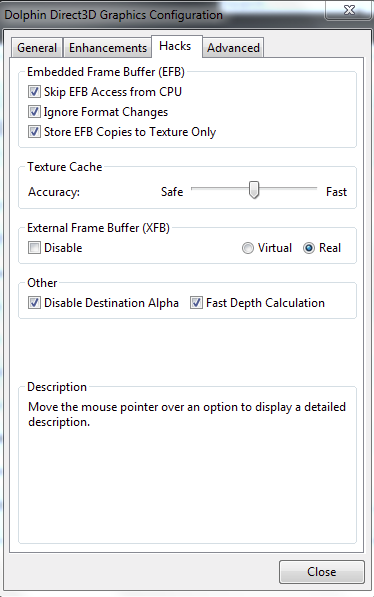 The option 'Store EFB Copies to Texture Only', if unchecked, I would assume would be enabling EFB to Ram, rather than texture, that's the change between the Developer and the Stable versions. If it's checked, it'll enable EFB to Textures Only. Someone can correct me if I'm wrong. As for the option to overclock your CPU, as suggested by KHg8m3r, to do so, in the Developer version, go to Config, and then press the arrow until you see the 'Advanced' tab, and then move the slider until you see improvement, however, I would recommend reading the warning below it. That's correct. However, that setting shouldn't matter for Metroid Prime in most cases, because it's set automatically by the game INI. (03-07-2015, 03:42 AM)Naru2008 Wrote: As for the option to overclock your CPU, as suggested by KHg8m3r, to do so, in the Developer version, go to Config, and then press the arrow until you see the 'Advanced' tab, and then move the slider until you see improvement, however, I would recommend reading the warning below it. That will only change how fast the emulated CPU runs, not overclock the real CPU like I think KHg8m3r meant. Changing that setting is worth trying, though. Thanks for the replys i will test some of your advertisements. I will reply if anything has changed. My cooler is too weak for overclocking. :/ But i will buy a new computer this year with way better specs. So yet it works bearable for me thank you all for you help.